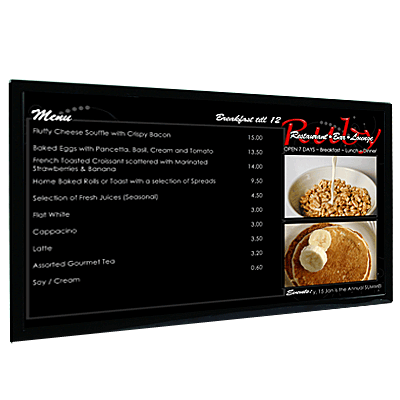 A Stand-alone Menu Board system utilises screens and a media player, and the Menu updates are done directly on the media player through a spreadsheet interface. All items required are provided in the package, excluding mounting hardware, cables and installation. We offer one custom template design and training on developing additional templates and managing the content. The interface to the Menu Board is a simple spreadsheet – change a price/description in a cell, save it, and the Menu is updated. The graphics on the Menu Board are limited by your imagination, and could contain striking high definition images of the dishes listed on the Menu Board. Time of Day scheduling allows automatic changes, for example change from the Lunch to the Dinner Menu at a nominated time of the day. Enhancements such as scrolling bars are simple to implement. We offer single or multiple panels in a range of sizes. Our Menu Board solution meets the challenges of airborne particulates in restaurants and bistros, particularly where the display is mounted over, or near, the servery or cooking area. Through the use of fanless commercial display panels, and industrial grade media players, airborne fat particles are not drawn into the display or media player by fans to form sticky deposits that attract and trap dust and fiber particles. Standard packages are available for single, dual, triple and quad screen systems, and commercial Full HD LCD panels are available from 40 inch to 60 inch. Small screen systems from 5-inch to video wall sizes are available. Call to discuss your specific requirements.